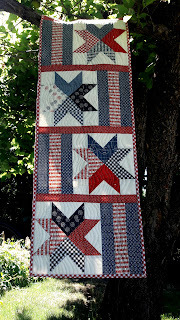 I'm thrilled to be the guest designer for International Association of Quiltersthis month. Imagine my surprise when I learned that Becky, the founder was a neighbor. Well almost she lives about 10 minutes away in the town I went to high school in, small world. 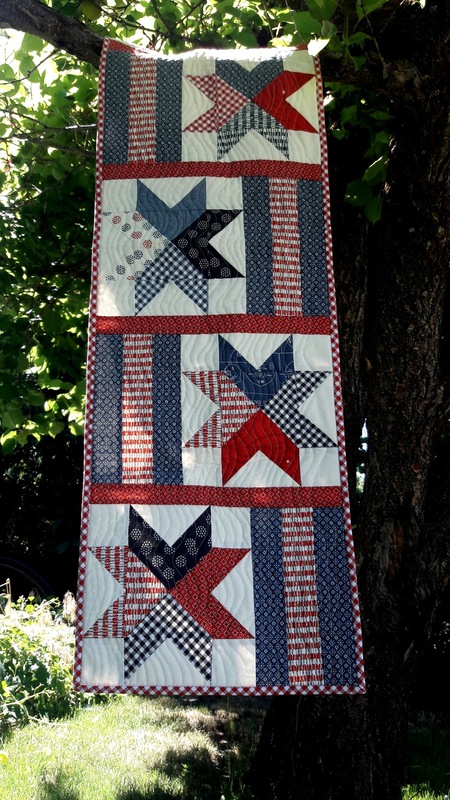 As a guest designer in July I felt it fitting to do something patriotic. I also wanted to do something quick and easy. Summer somehow seems busy rather than lazy to me, lots of parties, bbq, gardening, vacations, family and fun. I find it harder to get a little sewing time in but still want to have a finish once in awhile. So this little runner was my solution. It fits nicely on my table and looks festive with flowers from my garden. You can find the pattern and join this fun online group here. In addition to my pattern you will find sew alongs, tutorials, exchanges, and lots of other creative quilters. My raspberries are here in the garden and they are prolific this year. These raspberry plants have a story. When we first moved in we had a neighbor that was not so friendly. The kind of neighbor they make movies about, like Monster House. These raspberry plants came from their house. They spread through the fence. At first we only got a few raspberries. But I used this as a teaching experience for my kids, to let them know there is good in everything. That although are neighbor was not nice we did get yummy raspberries from him. The neighbor is gone and the sweet treat remains. 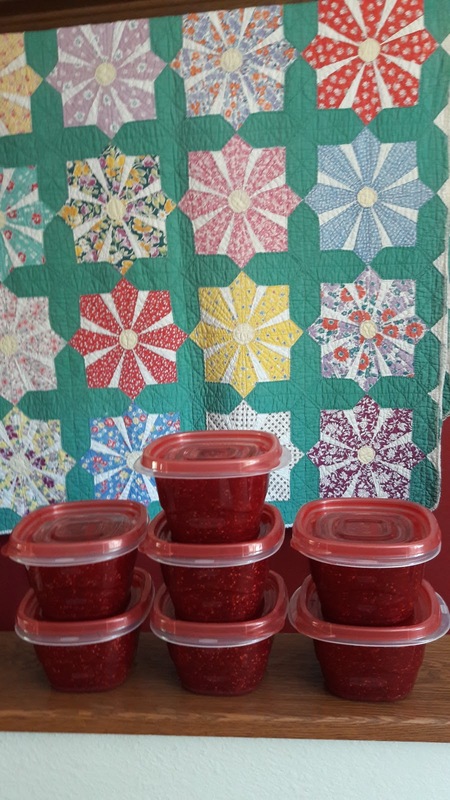 This weekend I made a bunch of jam from those sweet treats. Now it's your turn. What have you moved forward during your busy summer. Link up and share. I have thought of putting raspberry's in one of my raised beds but I'm concerned of them putting out runners underneath and getting out of the beds - I wonder how to take care of that and if I really care if they do LOL - It would be so nice to have some fresh raspberries. 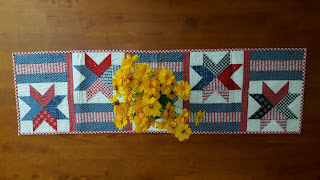 Your table runner is great. I like that it isn't just the stars. And the quilt behind the jam (yummy looking) is wonderful. Did you make that one too? Great runner! I really need to make one. I envy you the jam and raspberry plants. The jam looks so good! I love your story about the mean neighbor who inadvertently gifted you with free raspberries! I'm also curious about the quilt hanging behind your preserves -- is it vintage or did you make it? Really interesting blocks. Pretty runner! One day, maybe in 2018, I'm hoping to have table toppers (my table is round) for each season/holiday! So inspiring! Those yellow flowers really pop against your beautiful runner! Thank you for sharing and hosting the link up! 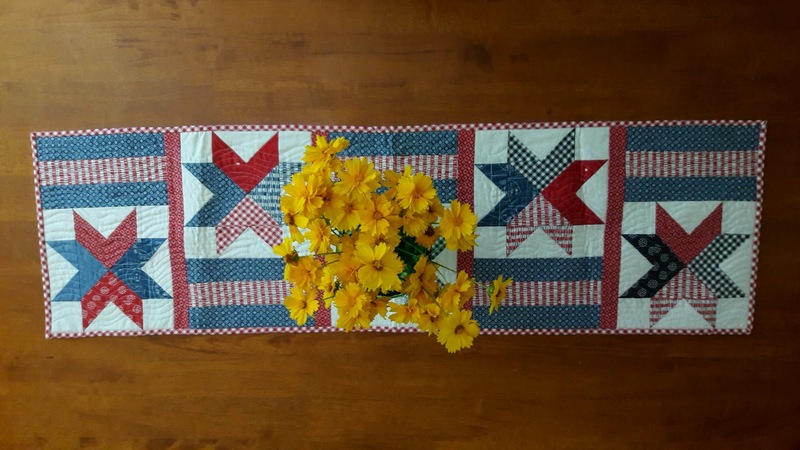 Your patriotic runner is wonderful hanging outside and on your table! The quilt behind the jams looks great too. Luckily we have a very friendly neighbour who shares the fruits of his garden happily with us.